Herrington played an integral part in all aspects of running the program at UOP the last two seasons. She helped coach the Tigers to 40 school records and produced NCAA qualifiers in back-to-back years for the Division I Championships. She also coached the 200-free relay to an NCAA Division I top-10 regular season ranking in 2017-18. In addition to her duties on the pool deck, Herrington handled all the administrative aspects of the program. She took the lead on fundraising, as well as NCAA compliance and daily operations within the program. Herrington has also built an impressive network throughout California and internationally as a key recruiter for the Tigers. 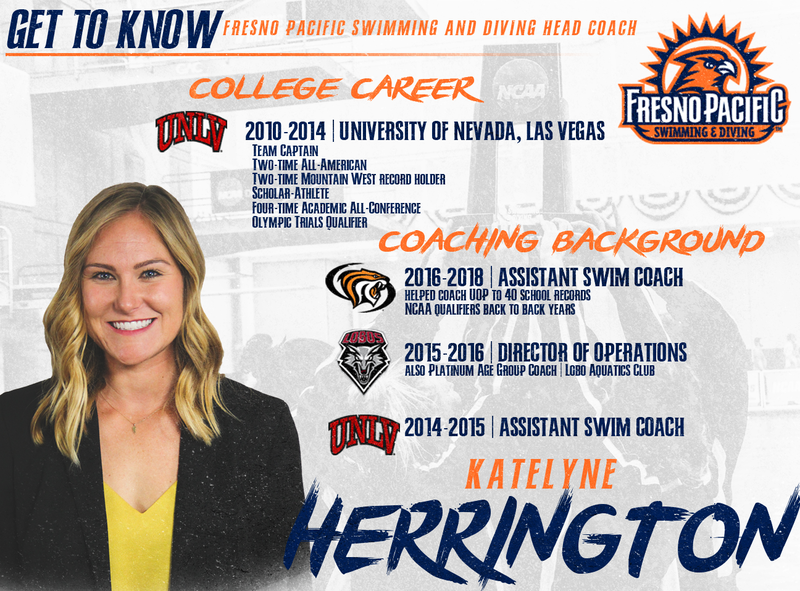 "I am honored to become the new head coach of the men's and women's swimming and diving program at Fresno Pacific University," said Herrington. "I want to thank Director of Athletics Aaron Henderson for this amazing opportunity and his warm welcome to the Sunbird Family. Within the first hour of my campus visit I truly felt at home, immediately feeling the sense of community Fresno Pacific has to offer. I'm very excited to have the opportunity to work with the team, coaching staff, administration and staff of the athletics department. I look forward to being part of such an incredible institution and building continued success within the program." Prior to serving as the assistant at UOP, Herrington was the director of operations for the swimming and diving program at the University of New Mexico for the 2015-16 season. She also coached for Logo Aquatics Club as the platinum age group coach. In 2014-15, she was an assistant coach at her alma mater, University of Nevada, Las Vegas. Herrington was a student-athlete at UNLV from 2010-14, where she was a team captain and a two-time Division I All-American. She was a two-time Mountain West record holder, still holding the 100 fly record with a time of 51.48, and also swam at the Olympic Trials. In addition, she was a scholar-athlete and four-time Academic All-Conference honoree. She received her bachelor's of science in hotel administration in 2014 from UNLV. Herrington brings a passion for swimming and student-athlete success to an FPU team that is coming off its best season at the NCAA Division II level in program history. The women placed fourth at the NCAA Championships, while the men took eighth. The Sunbirds will compete at the Pacific Open on Friday, Oct. 12 as the first full meet of the season.